Description: This Vintage Basket is a unique Macrame pattern that features two unusual vintage knots. This custom basket can be used to make decorative containers of different sizes. They can be used for snacks, flowers, baby items, etc. Please note that due to the flexibility of cord material, the basket will sag downward, as shown in the image above. It helps if you make the knots really tight. The instructions are for a medium basket, 8 inches in size. To adjust the size, use smaller or larger rings, and change the number of cords according to the formula provided in preparation. For an 8-inch wide basket, cut 28 cords, each 90 inches long. This is the number of cords you need to cut. Make sure you round up to a whole number. The Vintage Basket gets it's name from the knots frequently used in the 1900's. So the Venetian Picot Mount is described below. Step 1: Start by folding one cord in half. Tie an Overhand knot, tightening it so it's at the center. 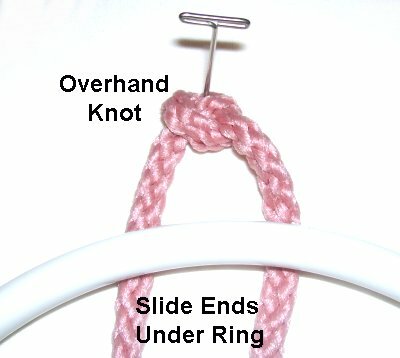 Slide the two ends under the ring, with the knot on the outside. Pass the left half of the cord over - under the ring, and over the cord just below. 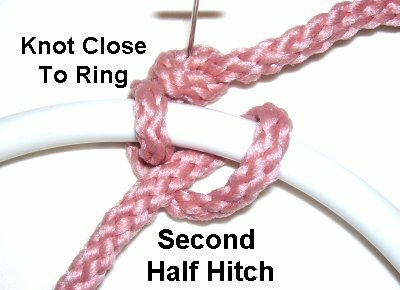 Tighten the Half Hitch firmly, so the Overhand Knot is touching the ring. 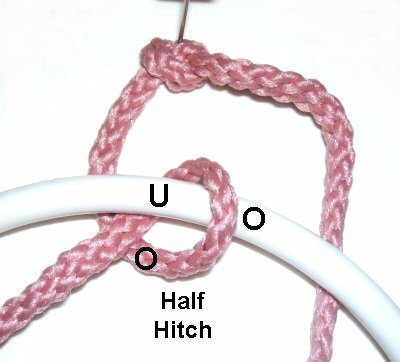 Tie another Half Hitch with the left half, placing it to the right of the first. Tie two Half Hitches with the right half of the cord. Mount the rest of the cords for the Vintage Basket in the same manner. Try to work in one direction. Add extra Half Hitches if the ring is not completely covered. 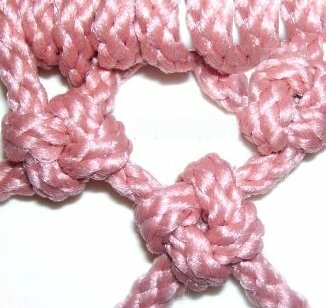 Now you'll be tying rows of Diamond Stitch knots, placing them between the rings. 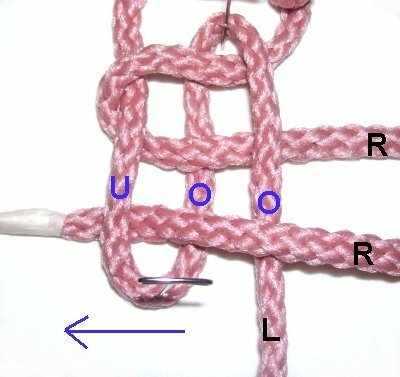 Each knot requires two cords. Designer's Tip: You can use Alternating Square Knots to make the main portion of the Vintage Basket. You will need two working cords and two fillers for each knot (total of 4). Count the cords to make sure the number can be divided by 4. Add extra cords if needed. Step 2: Use the left cord to make two bights. To do this, move the cord backward and forward so it looks like this image. Move the right cord through the bights from right to left horizontally. 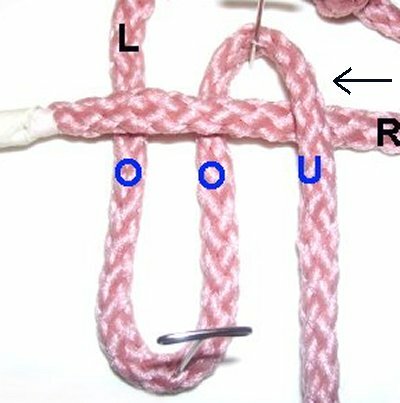 Pass under - over - over the three segments of the left cord. Move the right cord through from left to right. Pass under - over - under the three segments. Move the right cord over - over - under the three segments as you bring it back to the left. 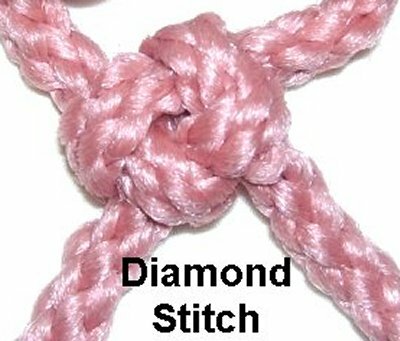 Tighten the knot so it's a diamond shape. The top point should be resting against the ring at the top of the Vintage Basket (next image). Step 3: Repeat step 2 with the remaining cords (in sets of 2). 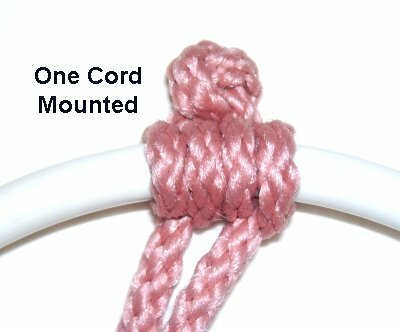 Use one cord from the first knot, and another one from the second knot. Step 5: Attach each cord to the 7-inch ring with DHH. It will be a tight squeeze, but you need to get them all on. You can use single Half Hitches to attach a few, but most need to be DHH. Step 6: Repeat steps 2 - 4. Attach each cord to the 6-inch ring. 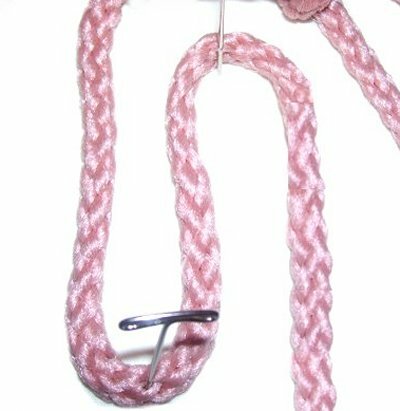 Use single Half Hitches as needed, to ensure that all cords are on the ring when you are finished. Step 7: Turn the Vintage Basket upside down to work on the bottom. Starting next to the last ring, tie the first row of Alternating Square Knots using four cords per knot. 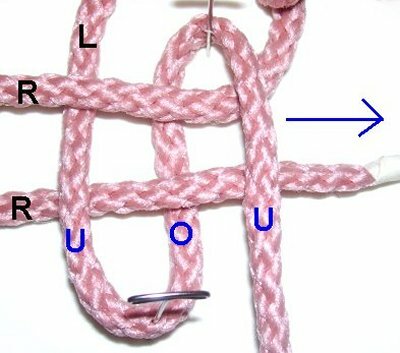 These knots should follow the curve of the ring. Make sure you use all of them. Step 8: Tie at least 3 more rows of ASK, dropping 4 cords from two different areas (total of 8 cords), before tying each new row. You will end with only a few knots when you reach the center of the ring. Dropping means that you push the cords to the inside. Tie the knots as if they were not present, pulling the cords across any gaps. Important: Make sure the bottom is FLAT, even if you need to drop additional cords. Step 9: Trim the ends so they are even. Weave them into the bottom section and apply glue to hold them in place. Another option is to trim the ends to 2 inches and unravel them, creating a fluffy bottom for the inside of the basket (recommended).